Abstraction of the method; closed/opened squares mean used/free blocks on the disk space. This post describes how to install Linux into Windows PC without removing or reinstalling the existing Windows. Please use this information at your own risk. This method may break your system or important data. 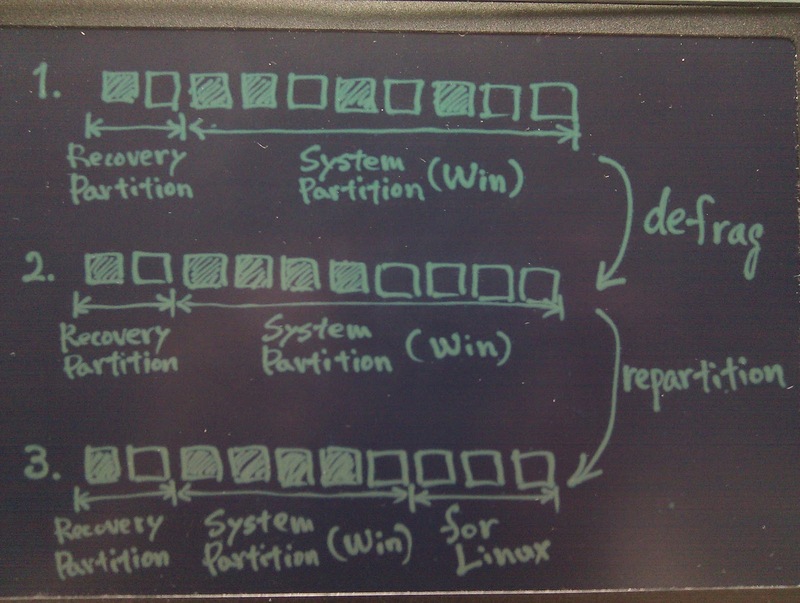 Defrag the system partition to protect the Windows data from following repartitioning. I'm not sure, however, this method is enough to protect your data. I strongly recommend you to copy your whole data for backup. Boot Ubuntu from the optical disk onto which you burn its ISO image. Repartition the system partition with gparted which the ISO image contains. You have to ensure an enough sized partition for Windows because this operation may drop necessary data. Format the data partition as fat32 because both of Windows XP and Ubuntu can use the format. /dev/sda1 was not touched. /dev/sda2 was shrinked to make space for /dev/sda4, /dev/sda5 and /dev/sda6. /dev/sda5 and /dev/sda6 are for Ubuntu, and /dev/sda4 is for user data which both of Windows and Ubuntu access. 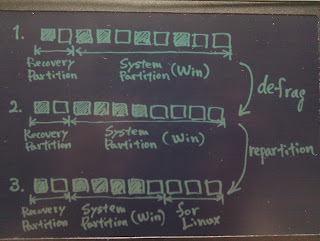 Mount the data partition and write out a bootsector image there. I gave the mount point the name of /winD because Windows treats the partition as D-drive. Remove the optical disk (or other boot devices) and reboot. Move bootsector.img from D-drive to root of C-drive (C:\bootsector.img). Reboot to confirm that you can select OS.